Home » Regency walking dress. Fashions for ladies and gentleman. 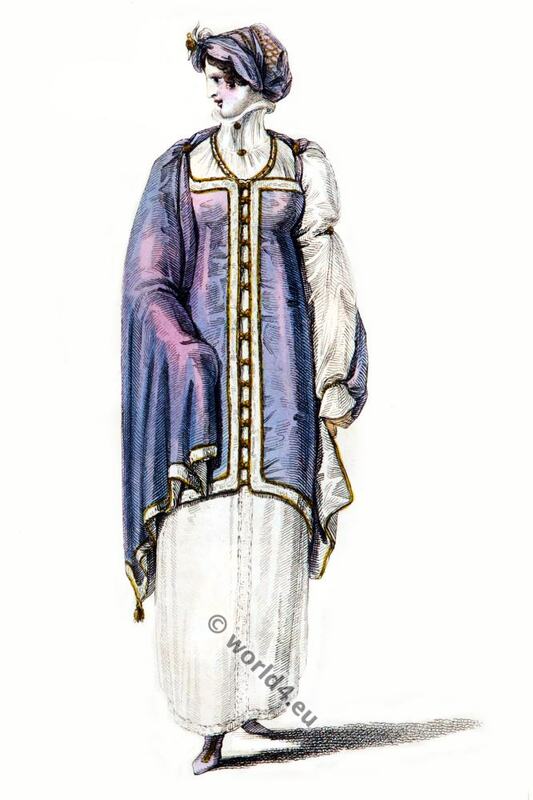 A tunic of lilac silk, clasped down the front with gold ornaments; a cloak of the same colour attached, so as to unite closely behind, but to fall loose over the shoulders; fixed on the shoulders with golden ornaments: the cloak is lined with white or straw-colored silk, and ornamented with a border of gold. Bonnet and boots of the same colour. Raised spotted muslin underdress, with loose sleeves, bound at the arms and wrist. Gold necklace, and York tan gloves. From the book: The repository of arts, literature, commerce, manufactures, fashions, and politics. London: Rudolph Ackermann. Incroyables et Merveilleuses by Horace Vernet. Reign of Louis XVI. 1774 to 1780. The French Republic 1789 to 1804. Reigns of Louis XVIII. and Charles X. 1815 to 1830.